(U//FOUO) The Transportation Security Administration’s (TSA) mission includes enhancing the security preparedness of our nation’s hazardous liquid and natural gas pipeline systems. 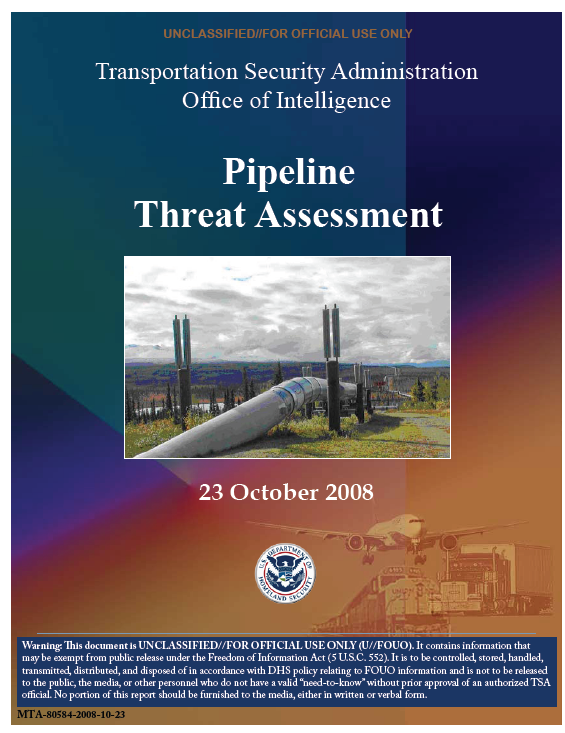 This 2008 threat assessment addresses terrorist attacks against oil and gas pipeline facilities overseas and considers the potential for attacks against the oil and gas pipeline industry in the United States. (U//FOUO) Pipelines are a mode of transportation with distinct characteristics and security requirements. Pipelines operate in all 50 states and transport more than two-thirds of all petroleum products, including gasoline, diesel and jet fuel, home heating oil, kerosene, and propane. Natural gas transmission and distribution pipelines transport natural gas from sources to residential, commercial, and industrial customers. Hazardous liquid pipelines transport crude oil to refineries and refined oil products to product terminals and airports. America depends daily on its pipelines to meet its oil and gas requirements. (U) Virtually the entire U.S. pipeline system and critical infrastructure is owned and operated by private entities. The U.S. pipeline system is comprised of 161,189 miles of liquid pipelines with more than 200 operators; 309,503 miles of natural gas transmission pipelines with more than 700 operators; and 1.9 million miles of natural gas distribution pipelines with more than 1,300 operators. (U//FOUO) At this time, there is no credible information regarding specific plans by terrorist groups or domestic extremists to conduct an attack on the U.S. pipeline network. 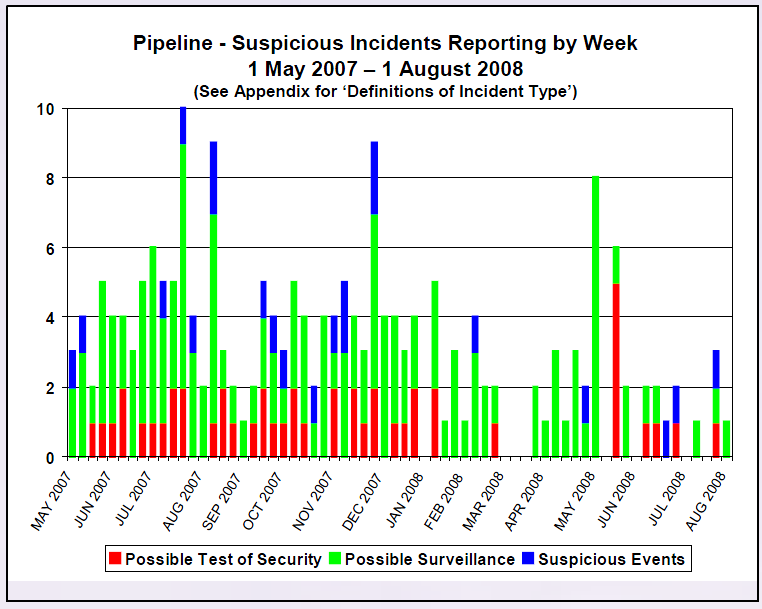 TSA’s Office of Intelligence (TSAOI) assesses, however, that the U.S. system and its related infrastructure remain an attractive target to both terrorists and domestic extremists alike, as long stretches of open unattended pipeline are difficult to protect and the economic impact of attacks would be significant. (U//FOUO) Al-Qa’ida, in particular, has noted the potentially damaging impact pipeline attacks—both in the United States and abroad—would have on the Homeland’s economy, national security, and public health and psychology. Al-Qa’ida’s demonstrated capability and intent to target oil and gas infrastructure overseas, and the group’s desire to continue attacks in the Homeland, suggest similar attacks could occur inside the United States. • (U//FOUO) Transnational terrorist groups, such as Al-Qa’ida, pose the primary threat to the U.S. pipeline network. Single-issue extremist groups, industry insiders, and lone wolves may also pose a threat to the pipeline system. • (U//FOUO) The interdependency of pipeline infrastructure with oil refineries, tank farms, and distribution centers increases the likelihood that the overall shared infrastructure will be impacted in the event of an attack. • (U//FOUO) Improvised explosive devices have been the preferred method of attack against gas and oil facilities worldwide. Vehicle-borne improvised explosive devices have also been a successful method of attack against pipelines and oil facilities. Pipeline control systems are also vulnerable to cyber attacks, although we have no indications that terrorists pose a threat to Supervisory Control and Data Acquisition supporting pipelines. • (U//FOUO) U.S- or Western-owned/operated pipelines in foreign countries are at increased risk of attack by Islamic extremists who oppose a foreign presence or who see a foreign presence as an embezzlement of natural resources. • (U//FOUO) Suspicious incidents involving photography and surveillance of pipeline infrastructure in the Homeland are of particular concern. Reporting such incidents can help law enforcement and homeland security officials identify unusual behavior, trends, patterns, as well as possible criminal acts or potential malicious interests or intent.